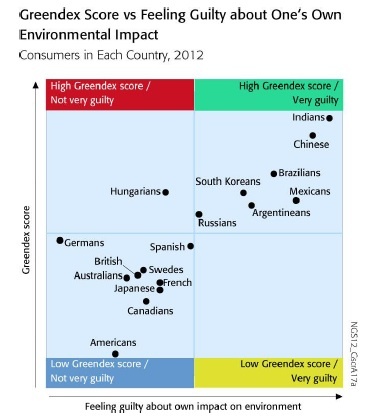 Charts: Which Country Feels the Most Guilty About the Environment? 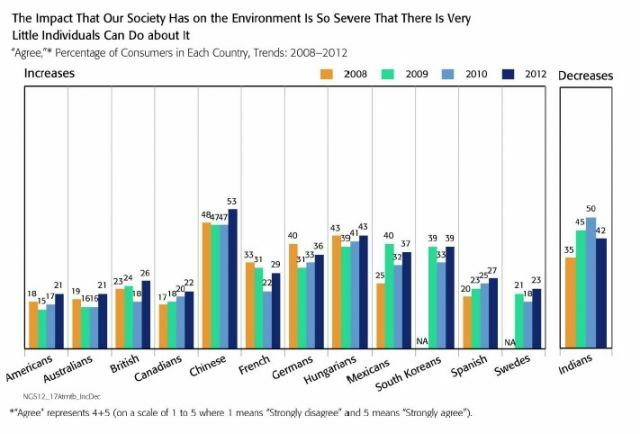 Americans are less likely than our international friends to make sustainable consumer choices, but we’re also less likely to feel bad about it, according to the National Geographic Society’s annual annual Greendex report. Researchers from NatGeo asked 17,000 people in 17 countries around the world about their habits—how much energy they use, how they get around, where their food comes from, what they think about environmental issues. And in their results, released on Thursday, they found that American consumers were the “least sustainable” for the fourth year running. India, China, and Brazil—three of the biggest emerging economies in the world—scored the highest on the survey.